This week's song is Mr. Monotony performed by Judy Garland in a deleted scene from Easter Parade (1948). For Irving Berlin, Mr. Monotony was the song that got away. The jazzy tune has been dropped from one film, two Broadway musicals, and one TV show since Berlin wrote it in 1948. MGM producer Arthur Freed planned Easter Parade (1948) as a showcase for Judy Garland, but ironically, the finished film doesn't have a standout solo number showcasing her great talent. Garland does plenty of singing and dancing, but it's mostly duets with Astaire in numbers like "Easter Parade" and "A Couple of Swells." Astaire gets plenty of time to shine in two solo numbers, "Drum Crazy" and Steppin' Out with My Baby," Ann Miller brings down the house in "Shakin' the Blues Away," and even Peter Lawford warbles "A Fella with an Umbrella." Judy Garland performs Mr. Monotony in Easter Parade (1948). Berlin wrote the novelty song, Mr. Monotony, for Garland's solo number. The song tells the story of a dull trombone player who is upstaged by a "snappy" clarinetist. Director Charles Walters had Garland perform the song in a men's fedora and tuxedo jacket, which was an unusual choice for a musical about turn-of-the-century vaudeville. Garland looks great and she sings even better, but the number doesn't have the same impact as some of Garland's signature performances like "The Man That Got Away." At the last minute, MGM studio executives cut the number from the film. They believed the song and Garland's costume didn't fit the time period, and they also felt the number was too risque for their No. 1 star, who was still beloved by audiences for her wholesome image. 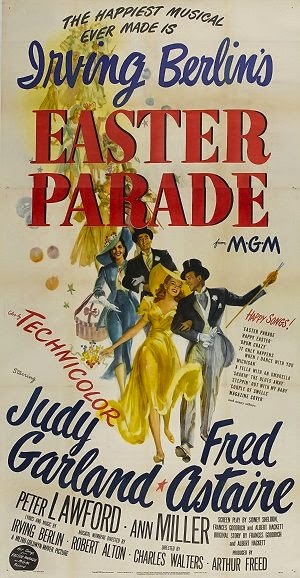 A vintage poster for Easter Parade (1948). Neither Walters nor Garland forgot about Mr. Monotony. Two years later, Garland and Walters re-teamed for Summer Stock, which was Garland's final film for MGM. Walters staged the "Get Happy" number in much the same way as Mr. Monotony; in fact, it appears that Garland is wearing a virtually identical costume. This time the number stayed in the finished film partially because Summer Stock is set in the 1940s. Also, "Get Happy" is superior to Mr. Monotony in most respects: The song is better suited to Garland's vocal style and Walters does a much better job of directing the number. 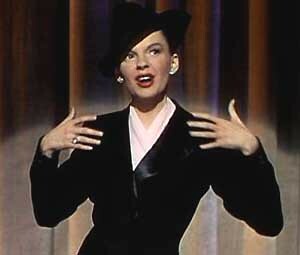 Instead of just Judy on a bare stage, she has a backdrop of heavenly clouds and a chorus of male dancers (clip below). While "Get Happy" helped make Garland a legend, Mr. Monotony continued to languish in obscurity. Berlin inserted the song in his 1949 Broadway musical Miss Liberty, but the number was cut during the out-of-town tryouts. Berlin tried again in 1950 when he put it in the score of Call Me Madam, but star Ethel Merman hated the song, so it was removed from the show. Mr. Monotony did get a mini-revival in the late 1980s when famed soprano Sarah Brightman included it on her album, The Songs That Got Away, which was a collection of tunes that were forgotten for one reason or another. Her version is below. Garland's original performance was finally seen in 1994 when it was included in That's Entertainment III. Even so, Mr. Monotony is still getting cut from productions. Matthew Morrison and Jane Lynch were supposed to perform the song in the fourth season of the TV show, Glee, but once again it was cut from the final episode, although a recording of the song was released (clip below).